CAMBRIDGE, Mass., April 10, 2019 /PRNewswire/ -- Adaptive Surface Technologies, Inc. (AST), a Cambridge, MA-based industrial technology company that produces the SLIPS® line of materials and coatings used for a wide range of industrial, marine, and medical applications, today announced the availability of its newest product, SLIPS® Foul Protect™ N1x. Designed for both freshwater and saltwater vessels, structures, and other equipment, SLIPS® Foul Protect™ N1x sets a new performance standard for non-toxic and environmentally friendly marine bottom paint. The product uses AST's patented modular fouling-resistant coatings technologies to create an ultra-smooth, slippery surface that algae, barnacles, mussels and other fouling typically present on submerged surfaces are reluctant to adhere to and are easily removed by natural water flow or during regular maintenance. "SLIPS® Foul Protect™ N1x represents over two years of product development and global testing to create a superior product that lasts multiple seasons, improves fuel efficiency, and isn't harmful to the environment like so many of the existing copper-based solutions today," said David Ward, CEO of Adaptive Surface Technologies, Inc. "We want boat owners to spend more time on the water and less time hindered by downtime incurred by cleaning, maintenance and general upkeep, and we are incredibly excited to launch this product and get N1x onto the hulls of recreational and commercial boats around the globe." Fuel Savings: SLIPS® Foul Protect™ N1x's superior performance and smooth surface helps boaters go faster and save up to 8% of fuel use. SLIPS® Foul Protect™ N1x is available today for order at http://adaptivesurface.tech. The product will begin shipping to customers on April 15. AST has been supported by the US Department of Energy's ARPA-E program, which assisted in developing AST's 2017 first generation SLIPS® Foul Protect™ N1 paint which had successful field trials in 2018. You can see a demo of AST's first-generation SLIPS® Foul Protect™ N1 product on Vimeo here: https://vimeo.com/301295526. 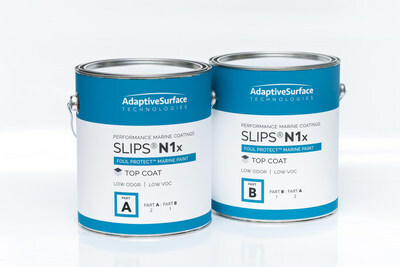 For more information Adaptive Surface Technologies in general, including its market-available SLIPS® Repel™ industrial manufacturing tank coating product, please visit http://adaptivesurface.tech. A world leader in repellent surfaces, Adaptive Surface Technologies, Inc. is a Cambridge, MA-based industrial technology company that produces the SLIPS® line of materials and coatings used for a wide range of industrial, marine, and medical applications. Our innovative coatings and cleaning maintenance systems create a slippery, fully liquid layer on surfaces that repel fluids, contaminants, and biological fouling agents. For more information, visit http://adaptivesurface.tech. SOURCE Adaptive Surface Technologies, Inc.